Acute myocardial infarction (MI) indicates irreversible myocardial injury resulting in necrosis of a significant portion of myocardium (generally >1 cm). The term "acute" denotes infarction less than 3-5 days old, when the inflammatory infiltrate is primarily neutrophilic. Acute MI may be either of the nonreperfusion type, in which case the obstruction to blood flow is permanent, or of the reperfusion type, in which the obstruction or lack of blood flow is long enough in duration (generally hours) but is reversed or restored after myocardial cell death occurs. Go to Myocardial Infarction and Right Ventricular Infarction for complete information on these topics. Acute myocardial infarction (MI) generally refers to segmental (regional) myocardial necrosis, typically endocardium-based, secondary to occlusion of an epicardial artery. In contrast, concentric subendocardial necrosis may result from global ischemia and reperfusion in cases of prolonged cardiac arrest with resuscitation. Areas of myocardial infarction may be subepicardial if there is occlusion of smaller vessels by thromboemboli originating from coronary thrombi. In the majority of patients, there is obstructive coronary disease at angiography. The area of infarct occurs in the distribution of the occluded vessel. Left main coronary artery occlusion generally results in a large anterolateral infarct, whereas occlusion of the left anterior descending coronary artery causes necrosis limited to the anterior wall. There is often extension to the anterior portion of the ventricular septum with proximal left coronary occlusions. In hearts with a right coronary dominance (with the right artery supplying the posterior descending branch), a right coronary artery occlusion causes a posterior (inferior) infarct. With a left coronary dominance (about 15% of the population), a proximal circumflex occlusion will infarct the posterior wall; in the right dominant pattern, a proximal obtuse marginal thrombus will cause a lateral wall infarct only, and the distal circumflex is a small vessel. The anatomic variation due to microscopic collateral circulation, which is not evident at autopsy, plays a large factor in the size of necrosis and distribution. Unusual patterns of supply to the posterior wall, such as wraparound left anterior descending or posterior descending artery supplied by the obtuse marginal artery, may also result in unexpected areas of infarct in relation to the occluded proximal segment. A proximal occlusion at the level of an epicardial artery results in a typical distribution that starts at the subendocardium and progresses towards the epicardium (the so-called wavefront phenomenon). 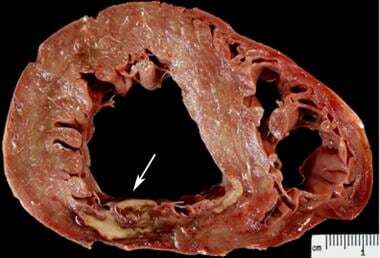 Therefore, an area of necrosis or scarring is considered to have an "ischemic pattern" if it is largest at the endocardium, with a wedge-shaped extension up to the epicardial surface. Ischemic injury, however, may be located in the mid myocardium or even the subepicardium if the level of the coronary occlusion is distal within the myocardium. Therefore, in cases of thromboemboli from epicardial thrombi (especially plaque erosions), there may be patchy infarction, often associated with visible thrombi within the myocardial vessels, not centered in the endocardium but occurring anywhere in the myocardium, including midepicardial and subepicardial locations. Acute myocardial infarction (MI) results from lack of oxygen supply to the working myocardium. Regional infarcts are due to lack of blood flow that occurs when an epicardial artery is blocked by atheroma or thrombus, or other obstructions. Global subendocardial infarcts occur when there is lack of oxygenation despite circulation—for example, when there is a respiratory arrest followed by prolonged hypoxemia. Autopsies of hospital inpatients dying of acute regional MI reveal an acute thrombus overlying atherosclerotic plaque in more than 95% of cases when the coronary arteries are carefully inspected. In the remaining hearts, there will be severe coronary diseases without thrombus. Rare causes of acute MI include no apparent cause (usually attributed to coronary spasm), coronary embolism (varied causes, including valve vegetations and tumors), spontaneous coronary artery dissections, congenital anomalies of the coronary origins, and thrombosis in nonatherosclerotic normal coronary arteries (hypercoagulable states). The symptoms of acute myocardial infarction (MI) are chest pain, which may radiate to the arm or jaw, sweating, nausea, and chest tightness or pressure. The diagnosis rests on laboratory findings of myocardial necrosis, which causes leakage of myocardial enzymes, such as troponin, into the circulating blood. Acute infarcts are divided by electrocardiographic findings into ST-elevation myocardial infarction (STEMI) and non ST-elevation infarction (non-STEMI). STEMI is usually the result of blockage of a coronary artery with large elevations of cardiac enzymes in the serum and eventually result in Q waves on the electrocardiogram. In contrast, non-STEMI, which overlaps with the acute coronary syndrome unstable angina, causes modest elevations of cardiac enzymes in the serum and pathologically shows small or patchy areas of necrosis. Q waves do not develop in non-STEMI. The earliest change that can be grossly discerned in the evolution of acute myocardial infarction (MI) is pallor of the myocardium, which is visible 12 hours or later after the onset of irreversible ischemia. 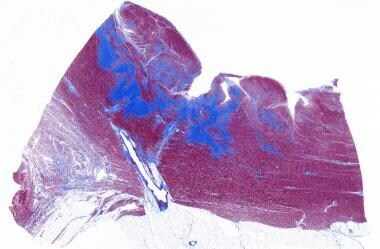 The gross detection of infarction can be enhanced by the use of tetrazolium salt solutions, which form a colored precipitate on gross section of fresh heart tissue in the presence of dehydrogenase-mediated activity. Myocardial necrosis can be detected as early as 2-3 hours in dogs and in humans by this method. 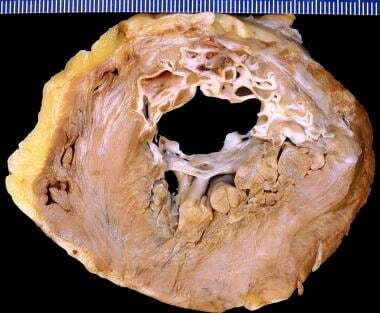 In nonreperfused MI, the infarcted area is well defined at 2-3 days, with a central area of yellow discoloration surrounded by a thin rim of highly vascularized hyperemia (see the first image below). In reperfused MI, the infarcted region appears red because of trapping of the red cells and hemorrhage from ruptured necrotic capillaries (see the second image below). Acute myocardial infarct. At 3 days, there is a zone of yellow necrosis surrounded by darker hyperemic borders. The arrow points to a transmural infarct in the posterior wall of the left ventricle, in this short axis slice through the left and right ventricular chambers. Acute myocardial infarction, reperfusion type. In this case, the infarct is diffusely hemorrhagic. There is a rupture track through the center of this posterior left ventricular transmural infarct. The mechanism of death was hemopericardium. At 5-7 days, the regions are much more distinct, with a central soft area and a depressed hyperemic border. At 1-2 weeks, the infarct begins to appear depressed, especially at the margins where organization takes place, and the borders take on a white hue. Healing may be complete as early as 4-6 weeks for small infarcts or may take as long as 2-3 months for large ones (see the images below). Areas of congestion and vasodilatation within healed scars may appear hemorrhagic. 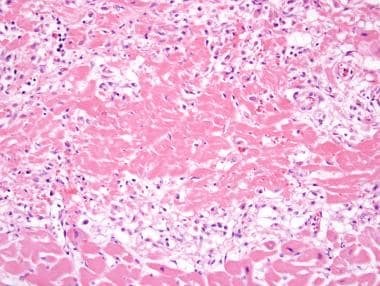 In these cases, mottled myocardium that gives the gross appearance of acute MI may, upon histologic examination, demonstrate only old fibrosis. Healing myocardial infarction, lateral left ventricle. In this heart, there is a variegated or mottled appearance to the lateral left ventricle (left). This infarct began 19 days prior to death. Early healed myocardial infarction, anterior septum. There is a glistening gelatinous appearance to this infarction, that occurred 6 weeks prior to death, from embolization during valve surgery. Healed infarcts are white from the scarring, and the ventricular wall may be thinned (aneurysmal), especially in transmural infarction (see the image below). In general, infarcts that occupy more than 50% of the ventricular wall, from the subendocardial to the epicardial surface, are considered transmural and are associated with Q-wave changes on electrocardiography. Healed myocardial infarction, anterior left ventricle. 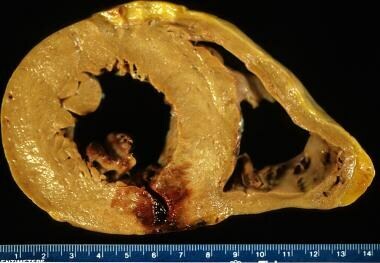 There is diffuse scarring (white) with marked thinning of the ventricle (aneurysm). Microscopically, the diagnosis of acute myocardial infarction (MI) rests on the presence of necrotic myocardium, with an interface of acute inflammation separating it from viable myocardium. 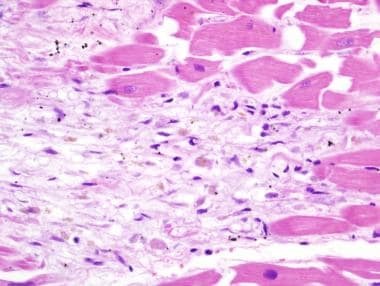 Areas of inflammation with a scar or areas of mummified dead myocardium bordered by granulation tissue do not indicate the presence of acute MI. The earliest morphologic characteristic of MI occurs between 12 and 24 hours after the onset of chest pain. 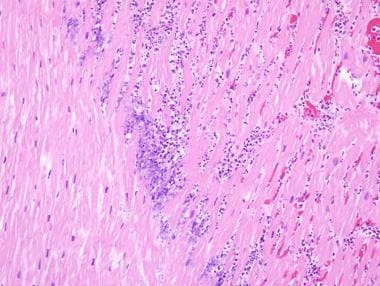 Hypereosinophilia of the cytoplasm as assessed by hematoxylin-eosin staining is characteristic of myocardial ischemia (see the first image below). Neutrophil infiltration is present by 24 hours at the border areas (see the second image below). Acute myocardial infarct. The earliest change is hypereosinophilia (above) with an intense pink cytoplasm. There is no inflammation at border between the necrotic myocardium and the viable myocardium (left and below), indicating that the necrosis is about 12-24 hours in age. Acute myocardial infarct. After 24 hours, there is a neutrophilic infiltrate at the border of the infarct. Viable myocardium is at the left, and neutrophils with apoptosis (karyorrhexis) are seen infiltrating the necrotic muscle. This patient experienced abdominal pain 35 hours prior to death. As the infarct progresses between 24 and 48 hours, coagulation necrosis is established, with various degrees of nuclear pyknosis, early karyorrhexis, and karyolysis. The myocyte striations are preserved and the sarcomeres elongate. The border areas show prominent neutrophil infiltration by 48 hours. 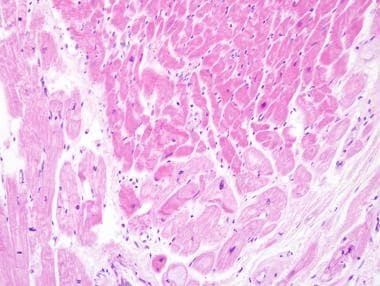 At 3-5 days, the central portion of the infarct shows loss of myocyte nuclei and striations; in smaller infarcts, neutrophils invade the infarct and fragment, resulting in more severe karyorrhexis (nuclear dust). By 5-7 days, macrophages and fibroblasts begin to appear in the border areas. By 1 week, neutrophils decline and granulation tissue is established (see the image below), with neocapillary invasion and lymphocytic and plasma cell infiltration. Healing myocardial infarct. This patient died 8 days after experiencing sudden chest pain at rest. There is a large area of necrosis with hypereosinophilia of myocytes, with a rim of viable myocardium at the very bottom. At the border, there is chronic inflammation with early granulation tissue, with ingrowth of endothelial cells. By the second week, fibroblasts are prominent, but they may appear as early as 1 week at the periphery of the infarct (see the image below). There is continued removal of the necrotic myocytes as the fibroblasts are actively producing collagen, and angiogenesis occurs in the area of healing. Healing myocardial infarct. At 10 days to 2 weeks, there is chronic inflammation, hemosiderin-laden macrophages, and early fibroblasts without significant collagen deposition. Healing continues and, depending on the extent of necrosis, may be complete as early as 4 weeks or may require 8 weeks or longer to complete (see the image below). The central area of large infarction may remain unhealed and show mummified myocytes for extended periods, even though the infarct borders are completely healed. Healed myocardial infarct. At 3 months, there is dense scar, which is blue on this Masson trichrome stain. 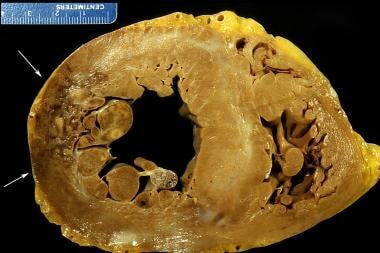 This infarct was subendocardial, in the posterior left ventricle near the ventricular septum. The histologic dating of MI may be important from a medicolegal point of view. There is no way of determining infarct age exactly, however, both because the histologic features that define the stages of repair overlap and because infarcts may enlarge, resulting in heterogeneity from one area to another. The border zone between necrotic myocardium and viable myocardium is the focus of dating, which depends on the reaction of viable myocardium to the area of infarct. At 24 hours of occlusion followed by reperfusion after 6 hours in a canine model, myocytes are thin, hypereosinophilic, and devoid of nuclei or showing karyorrhexis, with ill-defined borders and interspersed areas of interstitial hemorrhage. There is a diffuse but mild neutrophil infiltration. Within 2-3 days, macrophage infiltration is obvious and there is phagocytosis of necrotic myocytes and early stages of granulation tissue. Infarct healing is more rapid in dogs than in humans, most likely because of nondiseased adjoining coronary arteries (collaterals) and a lack of underlying myocardial disease. In humans with acute MI, there is often chronic ischemia secondary to extensive atherosclerotic disease. In humans, if reperfusion occurs within 4-6 hours after the onset of chest pain or electrocardiographic (ECG) changes, there is myocardial salvage, and the infarct is likely to be subendocardial without transmural extension. There will be a nearly confluent area of hemorrhage within the infarcted myocardium, with extensive contraction band necrosis. Within a few hours of reperfusion, sparse neutrophils are evident within the area of necrosis, but they are usually sparse. Macrophages begin to appear by day 2-3; by day 3-5, fibroblasts appear, with an accelerated rate of healing as compared with that of nonreperfused infarcts. Subendocardial infarcts may be fully healed as early as 2-3 weeks. Larger infarcts and those reperfused after 6 hours take longer to heal. Infarcts reperfused after 6 hours show larger areas of hemorrhage than do occlusions with more immediate reperfusion. Immunohistochemistry is of limited use in the diagnosis of acute myocardial infarction (MI). Immunolocalization of complement or fibrin may be helpful in identifying areas of myocyte necrosis, where there is leakage of extracellular proteins into the myocytes. In addition, markers of ischemia include hypoxia-inducible factor-1, complement leaking into myocytes, and cyclooxygenase-2, which can be demonstrated immunohistochemically. The morbidity and mortality of myocardial infarction (MI) result from arrhythmias, cardiac rupture, heart failure, valve insufficiency, and embolization. Arrhythmias include ventricular tachyarrhythmias, which are the most common cause of sudden death, especially early after infarction, and various degrees of heart block. 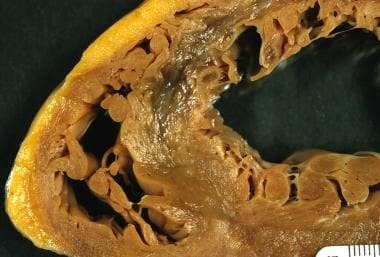 The risk of heart failure is proportional to the size of the infarct and the presence of papillary muscle necrosis. The size of infarct may be significantly decreased with prompt reperfusion after the first symptoms, either by thrombolytic treatment or by percutaneous intervention. Stem cell treatment is an investigative approach to minimizing myocardial infarct size. Burke AP, Virmani R. Pathophysiology of acute myocardial infarction. Med Clin North Am. 2007 Jul. 91(4):553-72; ix. [Medline]. Arbustini E, Dal Bello B, Morbini P, Burke AP, Bocciarelli M, Specchia G, et al. Plaque erosion is a major substrate for coronary thrombosis in acute myocardial infarction. Heart. 1999 Sep. 82(3):269-72. [Medline]. [Full Text]. Shiffman D, Rowland CM, Sninsky JJ, Devlin JJ. Polymorphisms associated with coronary heart disease: better by the score. Curr Opin Mol Ther. 2006 Dec. 8(6):493-9. [Medline]. Tousoulis D, Briasoulis A, Papageorgiou N, Antoniades C, Stefanadis C. Candidate gene polymorphisms and the 9p21 locus in acute coronary syndromes. Trends Mol Med. 2008 Oct. 14(10):441-9. [Medline]. Rosamond WD, Chambless LE, Folsom AR, Cooper LS, Conwill DE, Clegg L, et al. Trends in the incidence of myocardial infarction and in mortality due to coronary heart disease, 1987 to 1994. N Engl J Med. 1998 Sep 24. 339(13):861-7. [Medline]. Shah AS, Anand A, Sandoval Y, Lee KK, Smith SW, Adamson PD, et al. High-sensitivity cardiac troponin I at presentation in patients with suspected acute coronary syndrome: a cohort study. Lancet. 2015 Oct 7. [Medline]. Fishbein MC, Maclean D, Maroko PR. The histopathologic evolution of myocardial infarction. Chest. 1978 Jun. 73(6):843-9. [Medline]. Batts KP, Ackermann DM, Edwards WD. Postinfarction rupture of the left ventricular free wall: clinicopathologic correlates in 100 consecutive autopsy cases. Hum Pathol. 1990 May. 21(5):530-5. [Medline]. Hayashi T, Miyataka M, Kimura A, Taniguchi M, Kurooka A, Yabushita H, et al. Recent decline in hospital mortality among patients with acute myocardial infarction. Circ J. 2005 Apr. 69(4):420-6. [Medline]. Keeley EC, Hillis LD. Left ventricular mural thrombus after acute myocardial infarction. Clin Cardiol. 1996 Feb. 19(2):83-6. [Medline]. Disclosure: Serve(d) as a speaker or a member of a speakers bureau for: Edwards Life Sciences.